The include directive is one the three directive supported by JSP e.g. @taglib, @include and @page, while the include action is one of the many standard actions supported by JSP i.e. <jsp:include>, <jsp:forward>, <jsp:useBean>, <jsp:setProperty>, <jsp:getProperty>, <jsp:param> and <jsp:plugin>. Both are used to include the response of one resource into another e.g. composing JSP page with header portion coming form header.jsp, footer coming from footer.jsp and sidebar coming from sidebar.jsp. But as I said, they are very different from each other. 1) The most cirtical difference between @include and <jsp:include> is that the include directive is processed at the translation time but include action i.e. <jsp:include> is processed at the request time i.e. when the request comes for processing. 2) Second important difference between include directive and include action is thtat an include directive can use both relative and absolute path but the include action always uses relative path. 3) Third key diference between include action and include directive is that @include can only include contents of resource e.g. HTML or CSS file but it will not process the dynamic resource, while the include action i.e. <jsp:include> process the dynamic resource and result will be added to calling JSP. 4) One more practical difference between include directive and include action is that with include directive, you can not pass any other parameter e.g request, response or any configuraiton, but with include action, we can pass another parameter also using <jsp:param> tags. 5) Fifth difference is extension of previous difference i.e. 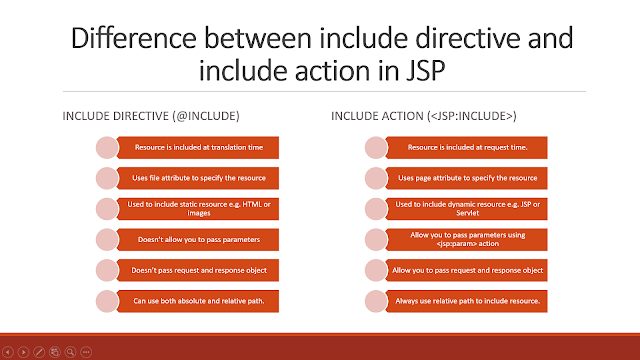 with include directive, you cannot pass the request or response object to calling jsp to included file or JSP or vice versa, but with include action, it's possible to pass request/response object. 6) Last but not the least difference between include directive and include action is that former uses the file attribute to specify the resource to be included and that's why know as file include as well. On the other hand include action uses page attribute to specify the resource to be included, hence also known as page include in JSP. That's all about the difference between include directive and include action in JSP. As I said, it's one of the classical questions from Servlet and JSP interviews and frequently asked during the telephonic round of Interview. While answering this question you should remember to mention the key points like include action does request time inclusion and you can include dynamic resources like response of another JSP or Servlet using include action.